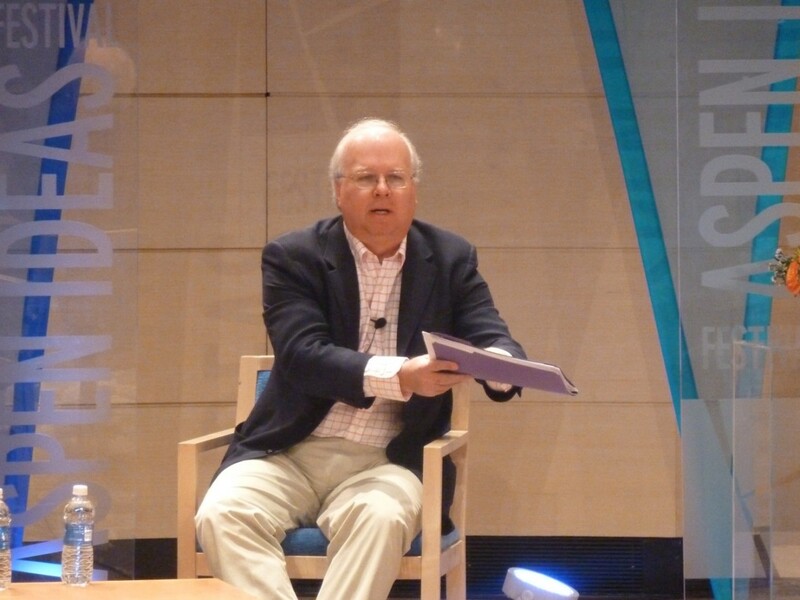 Karl Rove on stage at Paepcke Auditorium on Thursday, June 27 at the Aspen Ideas Festival. Colorado Gov. John Hickenlooper said Thursday at the Aspen Ideas Festival that he does not plan on running for president in 2016. “I have no interest in running in 2016, just so that we are absolutely clear,” Hickenlooper said in response to a question from interviewer Derek Thompson, business editor at The Atlantic. Hickenlooper, a Democrat, was elected to a four-year term as governor in 2010 after serving as Denver’s mayor for almost eight years. The question to Hickenlooper sounded relevant in the context of other discussions on Thursday. Earlier in the day, Karl Rove dissected Mitt Romney’s losing 2012 campaign against President Obama in an interview in Paepcke Auditorium, and then joined a morning panel on the future of the Republican party. The GOP panelists reeled off a list of potential presidential candidates, New Jersey Gov. Chris Christie, Sen. Paul Rand, Sen. Marco Rubio, Wisconsin Gov. Scott Walk and Ohio Gov. Jon Kasich. Also mentioned was U.S. House Majority Leader Eric Cantor, who is slated to speak at the Benedict Music Tent on Saturday at 2 p.m.
During his hour-long interview at noon, Hickenlooper talked about Colorado’s diversified economy, expanding drilling and fracking setbacks, the increased use of powerful pot by young people, his disdain for negative political ads, strengthening background checks on gun buyers, and deciding not to execute “a cold-blooded killer” with a mental disability. Hickenlooper was then asked if he had an announcement about 2016. A man in the audience then stood up asked Hickenlooper if he would like to come be governor of his home state, Illinois. Finding good political candidates was much on the mind of Republican strategist and fundraiser Rove on Thursday, who was interviewed at 8 a.m. by James Bennet, the editor of The Atlantic. “Thank you very much as a conservative for integrating the speaker lineup,” Bennet said to Rove. “I’m happy to spend time in Aspen, the ‘Moscow in the mountains,’” Rove replied, producing a knowing and hearty laugh from the Ideas Fest crowd, which often reflects Pitkin County’s liberal sentiments. Rove, now a contributor to The Wall Street Journal and Fox News, was a longtime senior advisor to George W. Bush and helped elect him twice to the governor’s office of Texas and twice to the White House, where Rove served as deputy chief of staff. He’s also the co-founder of the American Crossroads super PAC, which spent $105 million in the 2012 election in support of Republican candidates, including Romney. An affiliated organization, Crossroads GPS, spent $70.8 million. However, Rove had a tough election. Shortly before the election he predicted Romney would win, and Rove’s organizations only had a 21 percent success rate in the races where they spent money, according to Open Secrets, which tracks campaign spending. “The normal rules didn’t apply,” Rove said about the election. Rove said typically if a president is at an approval rating of 49 percent going into an election, as Obama was, he will lose the election. Rove also said Obama’s win was a “tactical victory,” citing the Obama campaign’s “grand bet” to run negative ads during the summer about Romney’s experience at Bain Capital. Rove also said Romney should have been less reticent to let the American people get to know him. He said Romney’s campaign should have made more of the story of Romney counseling and consoling the dying 14-year-old son of New Hampshire residents Ted and Pat Oparowsky. The couple spoke briefly and movingly at the Republican convention about Romney’s compassion, and Rove thought the campaign should get the story out to a broader audience, so his organization made a TV ad and ran it in battleground states. Rove also said that Romney could have done a better job answering a question about his wife’s horse competing in the London Olympics by explaining that riding horses had helped Ann Romney in her fight with multiple sclerosis. Despite his candidate losing the race, Rove said his “incredible group of donors” were still engaged and looking forward to the next campaign. “They want to place a bet on the elections with us to try and make things be better than they would otherwise be,” Rove said of his big donors, who he is not required to identify. Editor’s note: Aspen Journalism and the Aspen Daily News are collaborating on coverage of the Aspen Ideas Festival. The Daily News ran this story on Friday, June 28, 2013.